Blake Lively’s engagement ring is a little smaller than those worn by contemporaries, but don’t let that fool you. Its seven-carat pink diamond is an extremely rare gem, and the delicate rose gold and pave diamond setting showcases it perfectly. 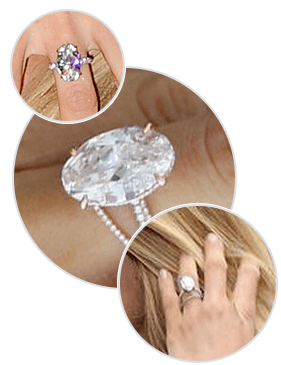 Like many other celebrity engagement rings, Blake’s was designed by jeweler Lorraine Schwartz. Blake Lively fans were taken by surprise when she and hubby Ryan Reynolds quietly wed at South Carolina’s Boone Hall Plantation after dating for just one year. It was only after the ceremony that anyone got a look at this incredibly stunning celebrity engagement ring. Like Blake Lively’s engagement ring, this beautiful example from Brilliance features a lovely oval center stone set in rose gold with pave diamonds along the shanks for extra sparkle. This gorgeous custom engagement ring was created with the same exacting craftsmanship that goes into celebrity engagement rings, yet it comes with a much lower price tag. Notice that the center diamond is set in a way that will allow your wedding ring to be worn alongside, just like Blake’s. Born August 25, 1987, Blake Lively is perhaps most famous for her starring role as Serena van der Woodsen in CW’s Gossip Girl. She has also appeared in a number of films including The Sisterhood of the Traveling Pants, The Town, The Private Lives of Pippa Lee, Accepted, Green Lantern, and Savages. Blake’s first role was a small part in the 1998 film Sandman, which was directed by her father, Ernie Lively. She was just eleven years old at the time. Her 2005 role in The Sisterhood of the Traveling Pants earned her a nomination as “Choice Movie Breakout, female,” Teen Choice Award. Not only was Blake featured in TIME magazine’s 2011 list of the 100 most influential people, she was named AskMen.com’s most desirable woman that same year. In 2012, People magazine named her as “Choice Movie Breakout, female,” Teen Choice Award. Not only was Blake featured in TIME magazine’s 2011 list of the 100 most influential people, she was named AskMen.com’s most desirable woman that same year. In 2012, People magazine named her as one of 2012’s “Most Beautiful at Every Age.” It’s not at all surprising that Lively was named the new “face of L’Oreal Cosmetics” in October of 2013. What Our Experts Have to Say about Blake Lively’s Engagement Ring. Blake Lively’s engagement ring is a great example of Lorraine Schwartz’s work. It features a fine, rare gem, and it looks perfectly balanced. The 7-carat pink diamond at its center is a large one; however it is not so large that it overpowers Blake’s delicate hand. Initial reports that the ring was valued at about $2 million are way off; a price of several hundred thousand dollars is more likely. Fancy color diamonds are gaining popularity, and perhaps that’s because they are taking starring roles in so many celebrity engagement rings. Despite the high price tags associated with very large stones from Hollywood jewelry stores, it is possible to create a similar look of your own for much less than you may think. By working with Brilliance, you can easily use our simple design tool to create a look of your own that won’t break the bank, and personal assistance allows you to use your favorite celebrity engagement ring as inspiration for your own. Whether you choose from the many popular looks we carry or decide on a design based on Blake Lively’s engagement ring, you’ll be enchanted with the sparkle it brings into your life.